1964. These are some of the neighborhood kids. 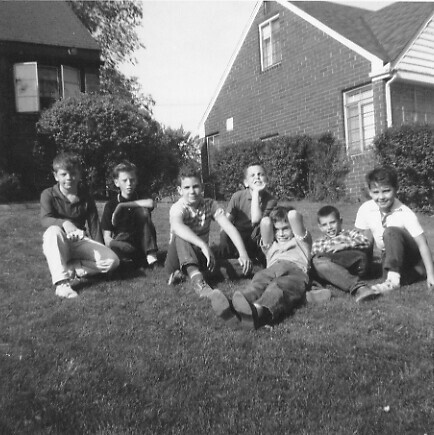 Keith Becker, Danny Perkovich * , me * , my brothers Bill and Greg * , Johnny Perkovich * , and Brian Ward, sitting on our lawn on a glorious summer's day. At 1387 Colonial Drive, Inkster, MI. Judging by the shadows, it's around 6 PM in the late summer. * indicates St. Norbert School alumni.